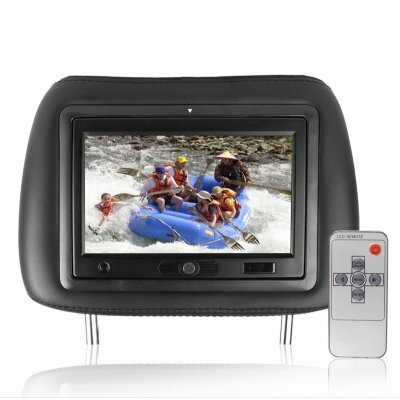 Successfully Added 7 Inch Headrest LCD Monitor - AV IN+ Memory Card Reader to your Shopping Cart. Made in China luxury headrest monitor for replacing your old headrest with a cool gadgety LCD monitor for all your back set passengers. This high end car accessory features an AV IN for receiving images from DVD players or other video equipment as well as a SD, MMC, and CF memory card reader for direct playing of MP3/4 digital media files. With its adjustable strut length and screen angle, as well as its high quality faux leather construction, it is perfect addition for almost any car. Importing this item directly from China is both fast and easy with Chinavasion, and with no MOQ, ordering even one sample for yourself or for testing is a breeze. By ordering this item you will receive a single headrest, if you wish to have a matching pair you will need to order 2 of this item.